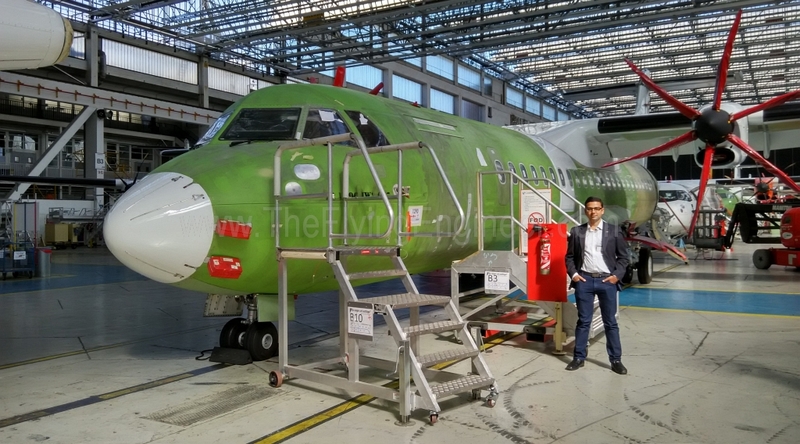 Last week, at the same time that I was visiting the Airbus A330 and A380 final assembly lines (FALs) at Toulouse (as part of my Aerospace and Aviation MBA program, which also included a visit to the ATR FAL) , the site “The Flying Engineer” crossed an important milestone. This milestone is significant considering the audience that the website caters to. It started by catering to serious aviation enthusiasts, pilots, and engineers. Along the way, realisation dawned that it isn’t the aircraft that makes an airline successful. It’s how the aircraft is used that makes the airline successful. This realisation made The Flying Engineer broaden, and eventually shift focus from pure technical to airline commercials and operations. How is it that in the same country a few airlines are profit making while the rest are loss making? How is it that one aircraft that is profitable for one airline in one part of the world is loss making for another airline? It boils down to management – the depth of management. Analyses – of airlines’ performance and the mindset of the management and/or promoters is key to understanding the future of the airline. The audience base has grown to include airline heads, promoters, aircraft manufacturers, and lessors. With such a niche audience base, and serious insightful content that puts most to sleep, views are limited, and crossing 1 million views in 4 years is a significant milestone. The country generating the highest views are the United States of America and India. UK, Canada, France and Germany make it to the top six. One of AirAsia India’s aircraft utilisation has increased to one of the highest in the country. 1 millionth passenger expected to be flown around August 5th. Typical turn around time: 25 -30 minutes. The airline, which started operations one year ago on June 12th, 2014, now operates a fleet of 5 aircraft from 2 hubs – Bangalore and Delhi. All of the airline’s present flights from Delhi are no less than 2 hours 20 minutes long. Such long flights ensure that the airplanes spend a larger fraction of the flight in air, resulting in higher aircraft utilisation. One of the airline’s 5 aircraft rotations flies only 2:30hr flights. This rotation covers a Delhi-Bangalore return, and two Delhi-Goa returns. 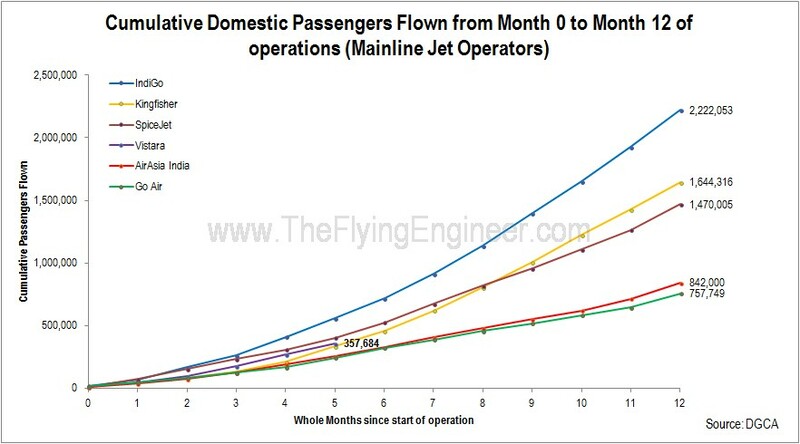 Together, the utilisation on this pattern totals to 15:10 hrs, which is 50 minutes short of the target that the airline had made public, but one of the highest in the country for all domestic operations. Average utilisation is however at 12:19 hrs, and the minimum utilisation is 11:00hrs. The average turn-around time at the airline is 36 minutes, a figure that is 16 minutes higher than the target of 20 minutes. However, turn around periods of 25 minutes and 30 minutes account for 70% of all turnarounds. There are no turnarounds of 20 minutes. Refer graph below. The airline recently added Imphal as a destination, raising the number of destinations to 10. The airline today flies 32 flights a day, deploying 5,760 seats a day and flying around 4,500 passengers daily. Till end May 2015, the airline had flown 716,000 passengers. The airline may fly its 1 millionth passenger on or around the 5th of August 2015. The airline may add a third Cochin flight in the morning, to provide a well spread out thrice daily service to Cochin from Bangalore. When added, all airplanes will be flying at near maximum utilisation in their rotations. No further growth is possible with the existing fleet. Aircraft between hubs may be swapped through the night flight I52227 DEL-BLR and I52228 BLR-DEL. Two rotations sync up at the right times to allow for a swap. Until a third Cochin is launched, the airline may use the morning flight I52221 DEL-BLR to swap airplanes. 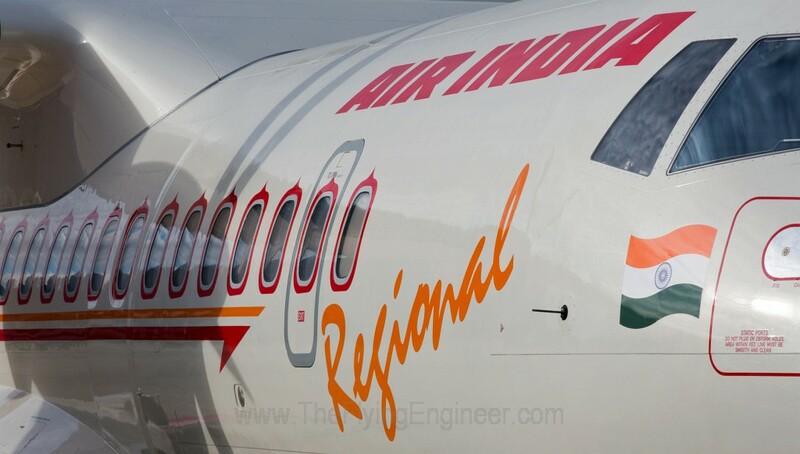 Ideally, considering that Delhi base has higher aircraft utilisation, the airline may realise a higher fuel saving by deploying two winglet-equipped aircraft at Delhi rather than just one as is the case today. Winglets help realise greater savings on longer flights. AirAsia India is a wonderful airline, and has got a few things right. Their on board service is one of those. As an airline, especially a start-up airline, making mistakes is inevitable. Falling short of projected growth plans and heavy flight cancellations and delays in certain months of the first year of operations are acceptable. Both these have happened to AirAsia India, and the industry understands. Of course, there are better examples, such as IndiGo, which has managed to play the game like no other. The unacceptable part? Factually incorrect statements that can lower the overall credibility of the industry. How many of the things planned initially have happened and how many have not? We have done certain things we did not expect. We have flown close to a million passengers. By the time we complete our first year we would have flown more than a million passengers. No other airline in India has done that before in their first year of operations. We have done that with a skeleton fleet, meaning, we have utilised aircraft significantly. We contest both claims  & , in the interest of factual correctness. 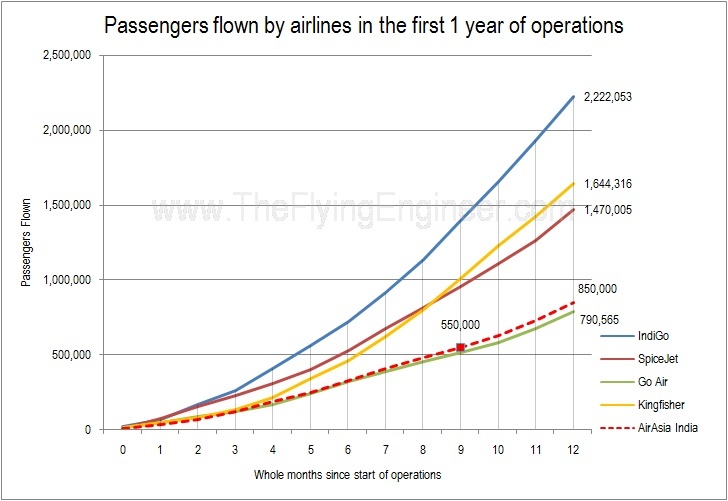 The graph on top (click to enlarge) shows the total number of passengers flown against the first twelve months of operations. All data is from the DGCA. IndiGo, Kingfisher Airlines, SpiceJet, and Go Air started operations in the 2005-2006 timeframe. Within the first one year of operations, all airlines in consideration, with the exception of Go Air, carried in excess of 1 million passengers. IndiGo crossed the 2 million mark in the first year! As of 31st March 2015, AirAsia India had carried 550,000 passengers. This means that the airline will need to carry 450,000 passengers to touch the 1 million mark by the end of June (AirAsia India started operations on 12th June, 2014). This means that the airline will need to carry on average 150,000 passengers in the months of April, May and June. Is this achievable? Data for the month of April and May were not available at the time of writing this piece. Since April had no new flights, but had infact cut 4 – Bangalore- Chennai & back, the airline flew around 97,200 seats in April. With an assumed 82% load factor – their highest so far, the airline could have flown no more than 80,000 passengers in April. 66% of May was flown with 18 flights a day, which totals to approximately 65,000 seats. Effective 21st May, the airline will operate 8 new flights. For 33% of the month this totals to around 47,000 seats. IN total, May can fly only 112,000 seats. At a generous 90% load factor, this is 100,000 passengers. In June, the airline will fly 28 flights a day, flying approximately 140000 seats a month. At 80% load factor, this will result in around 120,000 passengers being flown. 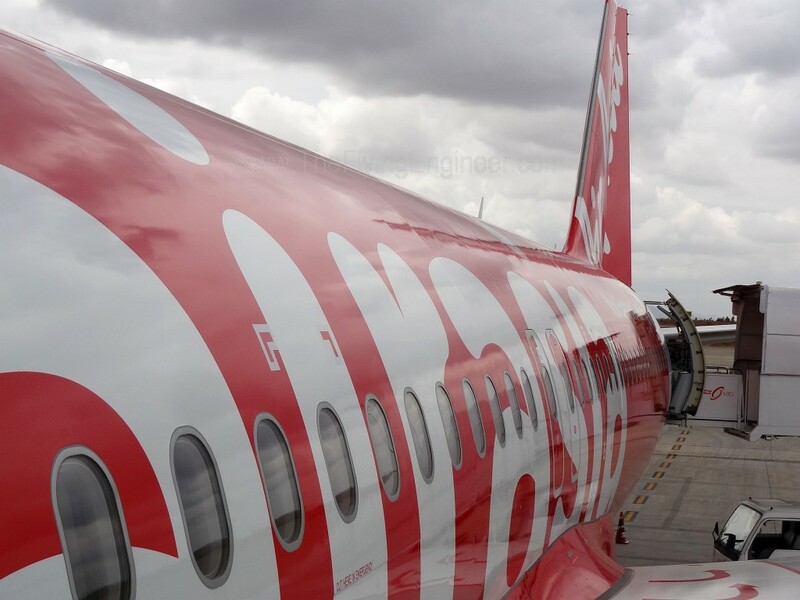 This means that AirAsia India will close its first year of operations with a maximum of 850,000 passengers, neither meeting nor crossing the 1 million mark. We wish the airline all the very best for its northern hub operations.